"In mid-16th-century France the pious middle classes and even on occasion the worldly courtiers were wont to sing psalms in elegant French translations by the court poet, Clément Marot. Since Marot had not made his translations for narrow sectarian reasons, both Catholics and Protestants used them, either for devotional purposes in their own homes, or for their own edification, singing the simple straightforward tunes to which the translations had been set, either monophonically or accompanied with lute, guitar, harpsichord, or some other similar instrument. 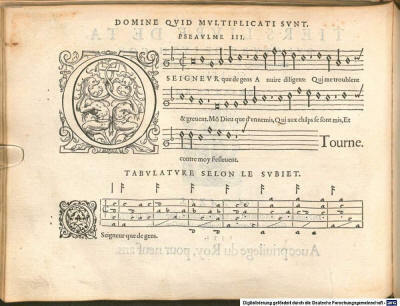 Even though numerous notices recommend or describe the practice of singing psalms and other "sainctes chansonettes" to the lute, no collection of this sort appeared in print until 1552, when Adrian Le Roy published his Tiers livre de tabulature de luth, contenant vingt & un Pseaulmes, Le tout selon le subjet. 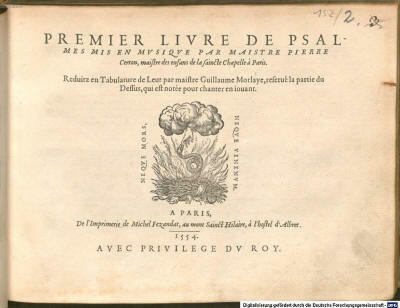 This was two years before Guillaume Morlaye published his intabulations for voice and lute of the psalms à 4 by Pierre Certon, Psaumes de Pierre Certon réduits pour chant et luth par Guillaume Morlaye (1554), the only other collection of psalms with lute printed in France in the 16th century." - Psaumes de Pierre Certon réduits pour chant et luth par Guillaume Morlaye (1554). Historical Introduction by François Lesure; Transcription and Commentary by Richard de Morcourt. (Paris Centre National de la Recherche Scientifique, Paris, 1957). (Pss. 6, 32, 33, 2, 13, 130, 114, 143, 137, 46, Simeon, 3) -- The 1555 edition (Cinquante Pseaulmes... Pierre Certon publ. LeRoy/Ballard ) contains all Marot Psalms and Canticles. These phantasies can be played on lute, but are basically instrumental. In another collection (Secretum Musarum, the secret of the Muses, 1615, f° 22) Vallet also published a lute-intabulation of "A Ton bras droit" (= Psalm 110, verse 5), based on the composition by Claude Lejeune (last Psalm in the Dodecacorde). On the CD Psaumes et Chansons de la Réforme Eric Bellocq supposedly plays this piece (track 22). However this is not the case. In reality he plays "Quand on arrestera la course coutumiere" (Secretum Musarum f° 21), also a composition of Claude Lejeune (no psalm but an Octonaire de la vanité et inconstance du Monde). Discovery made with the help of Christoph Dalitz (see below). testudinis usum non ineleganti modo accommodatos (Arnhem, 1617).